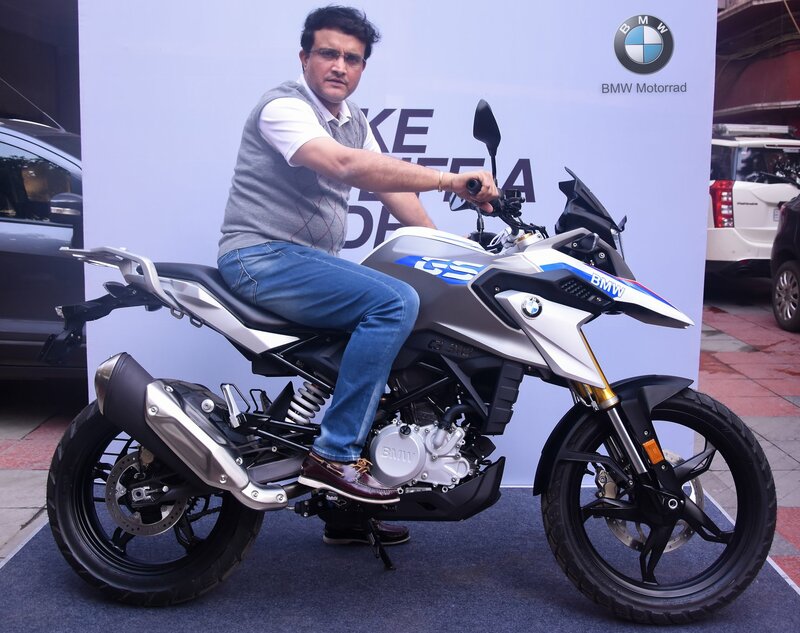 Former Indian cricket team captain and the 'Bengal Tiger' Sourav Ganguly has taken delivery of the BMW G 310 GS adventure tourer. The BMW G 310 GS was delivered to Sourav Ganguly in Kolkata. Dada is the second international cricketer to own the G 310 after Yuvraj Singh. 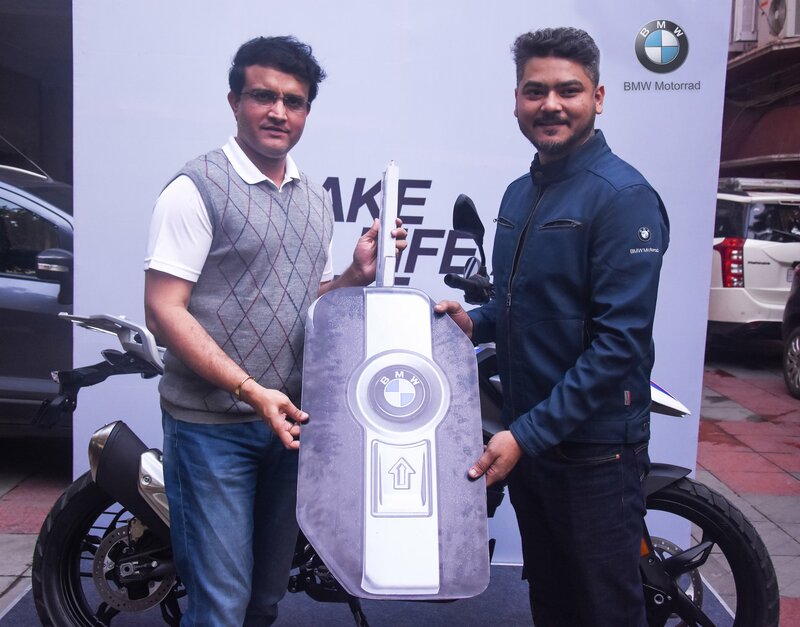 Sourav Ganguly joins swashbuckling all-rounder Yuvraj Singh to own the baby Beemer. While Yuvi got the BMW G 310 R, Dada has opted for the adventure tourer. The BMW G 310 GS has been priced at INR 3.49 (ex-showroom Delhi). The motorcycle was delivered to Ganguly in Kolkata. The Bengal Tiger is no stranger to two wheels as he has filmed for many Hero Honda commercials during his cricketing career, especially for a Hero Honda CBZ TVC with actor Hrithik Roshan. The BMW G 310 twins were launched in India in last July. TVS Motor Company manufactures both the motorcycles in Hosur, Tamil Nadu. The BMW G 310 GS is underpinned by a steel trellis chassis that is suspended by 41mm front USD forks and an adjustable mono-shock at the rear. The frame offers amazing torsional rigidity and uses the engine as a stressed member. Powering the BMW G 310 GS is a 313cc DOHC, liquid-cooled motor that comes paired with a 6-speed transmission. The fuel-injected engine is tuned to produce 34 bhp of power and 28 Nm of peak torque. Anchoring duties are performed by disc brakes at the front and back, while dual-channel ABS is standard. The BMW G 310 GS retails at INR 3.49 lakh (ex-showroom Delhi). Being an adventure tourer, the BMW G 310 GS features 19-inch front and 17-inch rear alloy wheels that run on 110- and 150-section Metzeler Tourance tubeless tyres respectively. BMW had managed to sell 1640 units of the G 310 twins by the end of 2018.